Installation view of American Masters at the National Gallery of Australia, Canberra. The National Gallery of Australia (NGA) has launched a major exhibition from its extensive collection of iconic works by the most important American artists of the 20th century. American Masters 1940–1980 brings together the work of artists who pioneered a massive shift in the nature of art during that period. The exhibition is a testament to the collecting vision and legacy of the early NGA, which culminated in one of the world’s best and largest collections of post-war American art outside of America. works of modern and contemporary art for Australia. More than 75% of the works of art in American Masters were purchased before the Gallery even opened in 1982. The NGA’s investment in American art was bold and often controversial. Starting with Abstract Expressionism, a movement that developed in the creative melting pot that was New York after World War II, American Masters explores how a generation of young Americans challenged tradition and reinvented modern art, paving the way for a series of movements such as Colour-field, Pop, Photo-Realism and Conceptual art, and redefining art itself. American Masters features over 150 works by more than 70 artists, including: Mark Rothko, Willem De Kooning, Frank Stella, Man Ray, Andy Warhol, Robert Mapplethorpe, Yoko Ono, Cindy Sherman, Sol LeWitt, Eva Hesse, Dan Flavin, Louise Bourgeois, Barnett Newman, Chuck Close, Roy Lichtenstein, James Turrell, Jackson Pollock and more. American Masters was made possible through the support of Principle Partner, Terra Foundation for American Art. 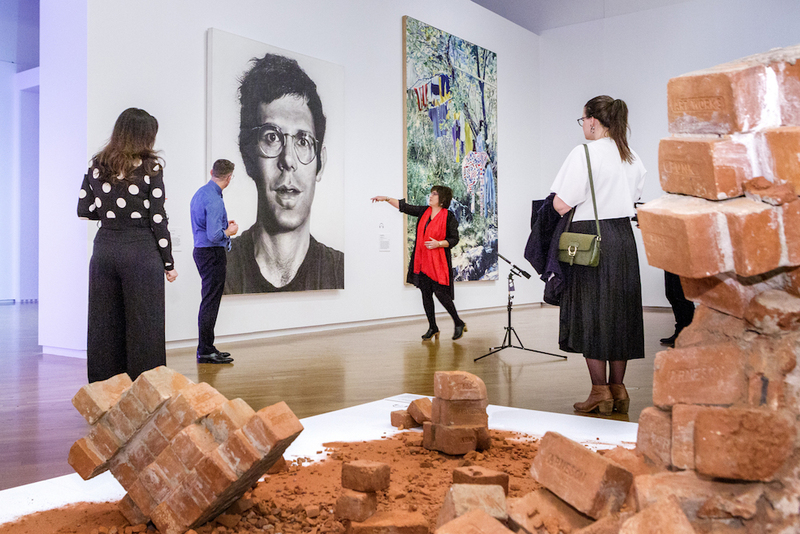 The NGA extends special thanks to the generous Exhibition Patron Ezekiel Solomon AM, Media Partners Win TV, The Canberra Times, The Sydney Morning Herald & The Age and the U.S. Embassy. American Masters 1940–1980 opens 24 August, and runs until 11 November. Free. Visit American Masters 1940–1980 at the NGA. Nick Mitzevich, NGA Director, and Lucina Ward, NGA Senior Curator International Paintings and Sculpture, in the American Masters exhibition at the National Gallery of Australia, Canberra.